NEW YORK—In George Orwell’s gripping novel “1984,” the most dangerous type of oppression is one not clearly defined but still capable of insidiously suffocating those who question its authority. 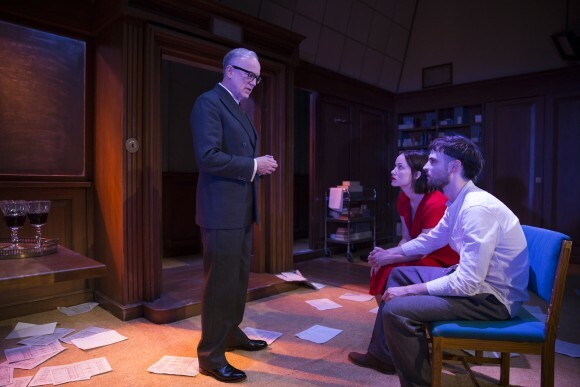 Yet for all its power and topicality, the current Broadway stage adaptation, a transfer from the United Kingdom, doesn’t present that message as cleanly as it could. In some future time, every person in this particular sphere of influence is under the continual surveillance of Big Brother, the party currently in complete control. This group literally watches everybody, with a telescreen in every room of every home and business—devices that can never be turned off or down. The same devices broadcast messages of controlled news and misinformation. 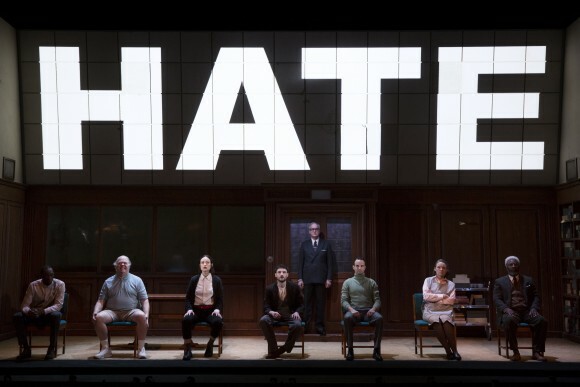 Without question, ‘1984’ is riveting. The work contains emotional twists and turns that at times feel like a punch in the gut. With time, pockets of resistance appear. One act of defiance comes from Winston (Tom Sturridge), a man guilty of “thoughtcrime,” who believes that he can escape detection. What Winston fails to realize is that when he becomes a rebel, he invariably begins to communicate a certain air, visible in the way he walks or responds to casual comments. He is set apart from those who simply go through life’s motions: people such as Winston’s co-worker Parsons (Wayne Duvall), who tells the same story at lunch every day. Anyone who gets in the way of his never-changing narrative, as does Syme (Nick Mills), a good party member in every other sense of the word, suddenly disappears. Yet Winston’s newfound attitude attracts the attention of Julia (Olivia Wilde), and the two begin an unsanctioned romance. However, the party has long since learned to manipulate the basic human need to become part of something special—be it through another person or an ideology—and are not above using this understanding to their own advantage. What makes the play so relevant in today’s world is its treatment of censorship and fake news. It is Winston’s job to delete records and documentation of certain individuals and events. He wipes them out of the pubic consciousness and in effect makes it so that they no longer exist. There are also various reports of war and of a rebel leader, though whether any of this is real, or to what extent, is uncertain. Certainly, the work poses an interesting ethical question. When Winston and Julia have a chance to join the rebellion, they’re asked how far they’re willing to go to defeat Big Brother. Would they take responsibility for the deaths of thousands of innocents? This issue of the end justifying the means comes up time and again through the ages. Government surveillance is a recent example. Without question, “1984” is riveting. The work contains emotional twists and turns that at times feel like a punch in the gut. 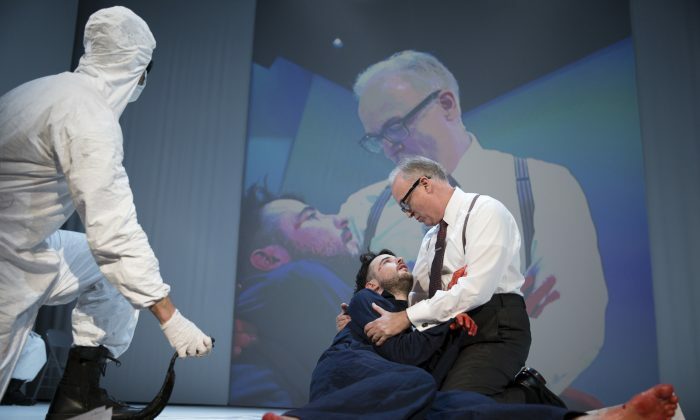 Yet, despite all of this, several creative choices made by adapters Robert Icke and Duncan Macmillan end up defusing the overall effect. The first such mishap occurs due to a framing device used at points in the play. While this idea springs from the appendix in the Orwell novel, its execution pulls the audience out of the flow of the narrative. The effect is that one tries to figure out exactly when the story is taking place, or if it’s actually happening at all, rather than being enveloped in the action. These sequences feel little more than tacked on rather than fully integrated. Also unnecessary is the graphic use of torture. Upsetting enough is the disclaimer saying no one under 13 will be admitted. Yet as Orwell clearly understood, the most terrible fears are those within your own mind. It’s the psychological exploitation of this fear that really makes things become stomach-churning, much more effectively than the impression of physical pain being inflicted. Sturridge is a fine Winston, a sort of beleaguered everyman. He’s not your typical rebel to begin with, and initially he just mouths the words of defiance—until he meets Julia. His love for her becomes a stronger motivator than his actual hatred of the system. Wilde works well as Julia, a driven, passionate soul with just enough mystery for one to question her goals. The most fascinating and brilliant performance comes from actor Reed Birney. Playing a party representative, he portrays someone who is evil incarnate. His complete belief that he will prevail and his determination to obliterate any hint of resistance creates an effect that is nothing short of soul crushing. “1984” has never seemed more topical than right now—though that’s probably a statement one could make every year since the book was first published in 1949. While the Broadway production is not nearly as powerful as it could have been, it still packs a wallop and is definitely more than worth the price of admission. Also in the cast are Sami Bray, Carl Hendrick Louis, Willow McCarthy, Michael Potts, and Cara Seymour; appearing on film: Max Baker and Richard Gallagher. No one under the age of 13 will be admitted.